My friend Tynan turned his small art collection into a museum-quality display in his home. You can do it, too. We will show you how. The Tynan Museum, located inside one of his homes in Las Vegas, NV. I interviewed him to find out why and how he did it. This article will help you upgrade how you show off cool stuff in your home. You can make your house or apartment feel like a really cool museum. I asked Tynan what materials he used, the format and fonts, the mounting process, and how he picked the layout. Tynan used 140lb ivory index stock. He noted that once he stops changing little things on the labels, he’ll have a print shop print them on thicker card stock and cut them properly. Print descriptions on gloss or luster paper. Then mount to mat paper or foam board so that it’s as thick as you prefer. To mount them, he used loops of tape because he kept moving them. Tynan’s Note: I will need a better solution once I get permanent labels. “When it comes to mounting the labels to the wall, we use a combination of blue painters tape and double sided foam mounting tape to 1. protect the surface of the wall, and 2. be strong enough to hold up thicker paper/foamcore/mat board. I think it looks nice because the thickness of the tape sets the label off of the wall just a bit and makes it look like the label is floating. 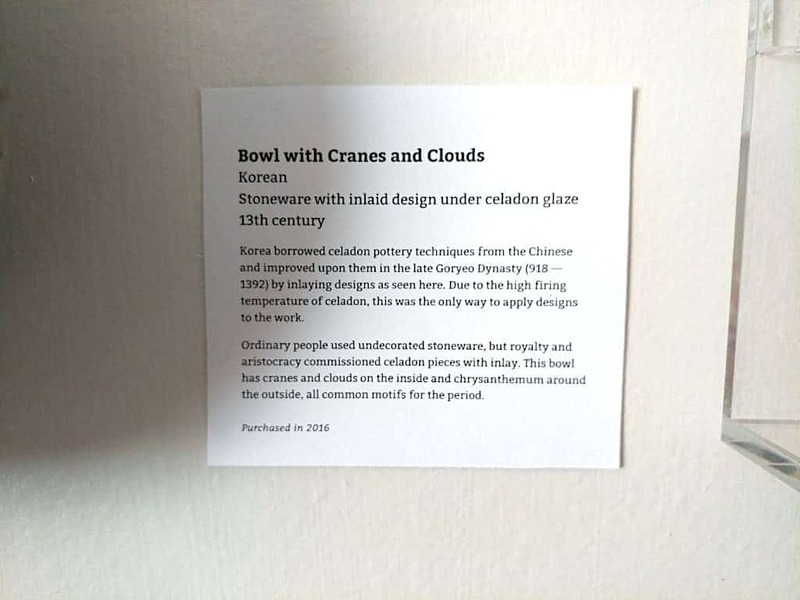 Tynan’s label for the Chawan Tea Bowl. Most museums have very specific guidelines for text labels. The National Park Service never uses fonts smaller than 24 points in their exhibits. The Milwaukee Art Museum always uses the Weiss Antiqua font. Tynan used Bitter, a free Google font. He likes it because it’s serious and readable, but was a more friendly than most museum fonts. High contrast between text and background is critical. Most museum labels are black text on a white background. If you are really interested in museum fonts, check out the Museums tag over at Fonts in Use to see which fonts are currently being used in museums. 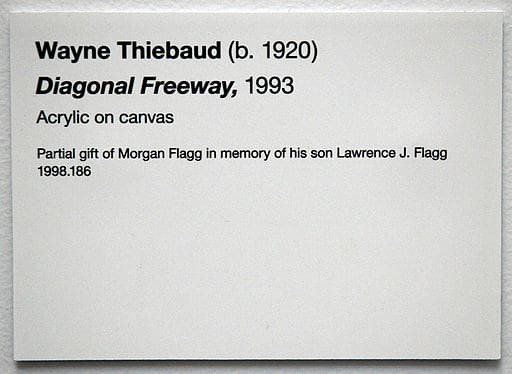 Label example from The Practical Art World. Tynan looked at a lot of different labels online before coming up with his own format. He assumed there was a standard format, but he found that there was a lot of variation. Q: How did you lay them out? A: I made the cards in HTML so that I could easily edit them and modify the styles for all of them at the same time. Probably something like LaTeX is better, but HTML was really quick and flexible. Nick’s note: You could also make your labels in Google Docs, Microsoft Word, etc. Research labels you love and combine elements of them (sizes, order, bolding, etc.) to make one that feels right in your space. 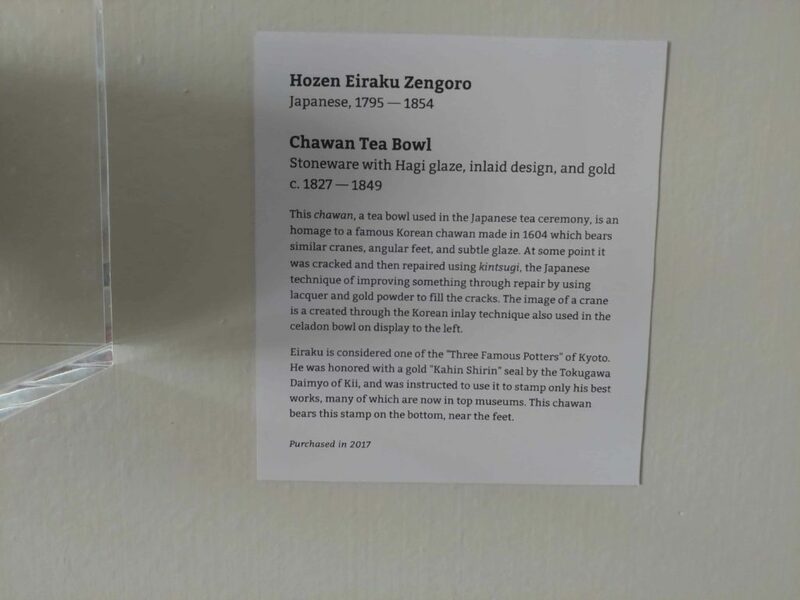 The plexiglass box around Tynan’s Chawan Tea Bowl. 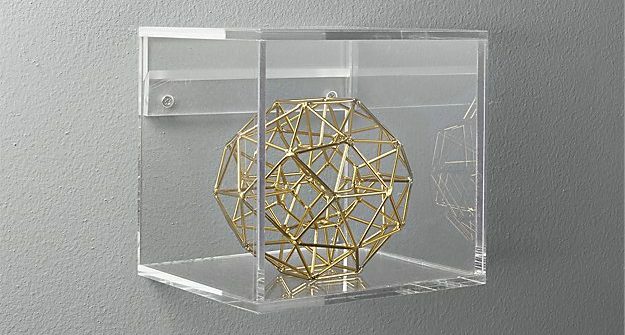 There isn’t one universal standard for display cases. Depending on artifact type, museum environment, lighting and a number of other factors, museums usually choose between museum quality glass or acrylic. CB2 Format Cube small size. They also sell a long version. For Tynan, these were the hardest items to find. There are a lot of similar boxes for sale, but they’re all meant to be placed on a flat table, not mounted to the wall. The ones he uses are from CB2 and are called “Format Cubes”. David Choe’s Homeless Millionaire. Tynan bought it when he was living in an RV. (Photo via minimums). Apartments and houses may not have the best lighting to highlight your art. Tynan used a big LED lighting track and a couple of light heads to aim at the pieces. Do you have a suggestion for better light heads for Tynan? Email me and I’ll send it to him! Lighting is tricky. There isn’t one best way to go about it. Not Tynan’s apartment. 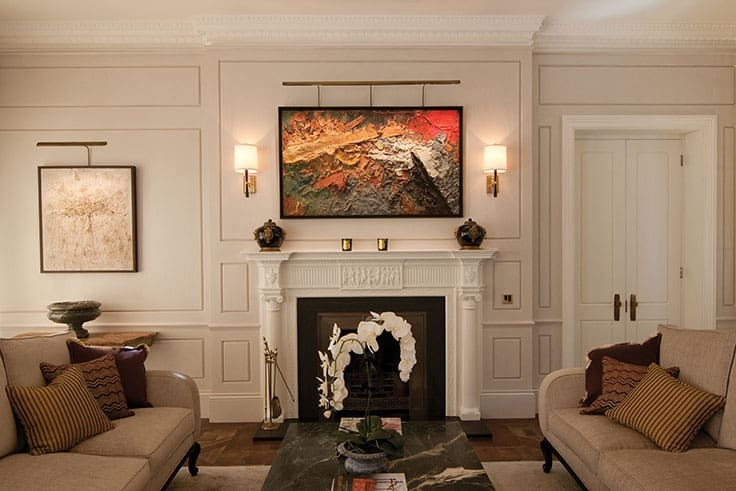 This picture is from another article about lighting artwork by Christie’s. The article Five Tips for Lighting Art in Architectural Digest is a great resource for learning about lighting angles, types, and quality. It talks about ceiling-mounted accent lights, track lights, wall washers, and conservation. Don’t choose lights or light bulbs that could be damaging to the art. The perfect angle for wall mounted art is 30-degrees. Wall-washers, like track lighting and picture lights, are a great option for spotlighting at home artwork. Finding the right kind of wall mounts for custom pieces, especially artifacts, can be tricky. Tynan used standard wall plate hangers for both the celadon bowl, above, and the Cederquist piece. He had to rebend the wire in both cases. If you’re interested in getting technical, the Northern States Conservation Center has a great resource on “mounts” and how to choose them. It also includes info on how to position artifacts and archival standards. If you have unique pieces, like toys, jewelry, or stamps, you can check out Home Museum which has pages upon pages of ideas on how to take care of and display unique home collections. Tynan in his apartment, photographed for a feature on minimums. Q: What was your goal in showing off your art like this? A: I am really excited about every piece I have in my collection, but when they’re just sitting on the wall without context I don’t think that enthusiasm is easily transmitted. Most people who live in small unassuming apartments like mine don’t have museum quality art, so I thought that by putting it in a museum context I could get people interested in the art. Q: What advice would you have for someone else who wants to do similar? A: I haven’t had many guests over since doing it, so I’m not sure what the reception will be. I think it may seem pretentious to some people, but hopefully, most will think it’s cool to have a mini-museum experience. I’ve found that I look at my art more since making them, maybe because the chats (labels) trigger some Pavlovian museum reflex. The most interesting tip I learned when doing research was to make the chat draw the reader back to the piece, so I rewrote some of them to mention specific elements of the pieces. Q: Has the museum-like setup you made started conversations with friends and guests? A: Yes, although maybe not as many as I expected it would. I made the object descriptions so that people could relate to the pieces, but most people don’t read them. The people who do get into it seem to be most excited about how old some of the pieces are. Q: How would you “hack” your own mini-museum? A: I actually have little stories about every piece so that I can give people tours if they ask about it. All of the works are things that I find extremely interesting, so I like teaching people about them. Q: Have you noticed a difference from when you had the artwork normally organized in the space? A: Yes, definitely. The biggest difference is that even though I built it, I treat it like a museum and I walk through most days and even read the little chats I wrote. Each of the pieces is something I would go out of my way to see in a museum, so it’s like a small slice of the most interesting museum for me. Tynan’s current favorite. This is Potter Eiraku Hozen’s homage to a 1600s Chawan Tea Bowl. Q: Which is your favorite piece? A: It changes, but right now my favorite is this tea bowl made by Eiraku Hozen in the early 1800s. He was one of the “three great potters” of Kyoto, and his works are in all of the biggest museums, like the Met. This particular piece is special because it is stamped with a golden seal given to him by the lord of his prefecture and was only used on his best works. It also has a crane motif done in a Korean inlay style, which can also be seen in a 13th-century celadon bowl I have and was an homage to a very famous tea bowl from 1603. Sometimes I drink tea out of it because I’ve always wanted to do that when I see pieces like this in museums. Q: If you could add any piece of art to your own collection what would it be? A: The unrealistic answer is that I would like a Vermeer. I go all around the world to see all of them, and only have five I haven’t seen yet. More realistically, I’d really love a Russian malachite vase. They take small pieces of malachite and arrange them in a mosaic such that the natural patterns of the stone line up and it looks like the vase was made of one solid piece. Pedestal and mounts by Pierre Philippe Thomire made with Russian malachite. The Met Fifth Avenue in Gallery 553. Q: What got you into art? A: It was actually an early Museum Hack private tour in New York City with you. Our mutual friend Ronen invited me. Before that, I would occasionally go to museums but didn’t really know what to do once I got there and didn’t feel like I related to any of the pieces. Thanks to Tynan for answering all my questions about his home museum display! Tynan makes most of his money as a writer, here are some of his books on Amazon. If you liked this post, please share it with someone who has a great art collection!